Nicholas “Nick” Worley comes to the Blogsavy staff bearing a number of accomplishments. Nick graduated with Honors from the largest high school in southern Georgia. He was selected as the South Georgia Star in Agriscience. He won the Senior Individual Engineering division of the Georgia State Agriscience Fair. 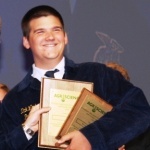 He also was named the 2008 National Agriscience Student of the Year by the National FFA Organization (an organization of more than one-half million students) and has recieved considerable scholarships from the Monsanto Company, among others. He conducted several scientific studies in high school. His first was entitled, “Physiological Influences on Animal Movement: Do Animals Follow Crepuscular Patterns?” In this research, he found that animals were more likely to move in low-light conditions due to the make-up of their ocular systems. His next research project was, “Simultaneous Saccharification and Fermenation of Forest Products to Produce Fuel Ethanol: Can Unmerchantable Biomass from Georgia’s Forests Produce Substantial Quantities of Ethanol?” Remarkably, this research proved that about 4 billion gallons of Ethanol could be produced annually from the unused waste in Georgia’s forests. On the more practical side, he has raised hogs and cattle. He now works part-time for the Cat Creek Cattle Company. He also babysits his younger sister in his free time. He enjoys outdoor recreation as well. Nick is currently a Pre-Engineering major at Valdosta State University. He has made the Dean’s List each semester.